Home Away From Home is located on the bottom level of my home. Parents & children enter/exit through the garage entrance; the garage door is left open always unless there is winter storm advisories. We have a complete security system so doors are remained locked at all times. All the children parents will have a code to enter the child care facility at anytime. This is just one more step in ensuring your child's safety. We also have cameras inside and out for extra protection. Best of all in case of a fire the Fire Department will be notified automatically! Main Daycare Area- Used for fine & gross motor skills, and imaginative play during free play. This is a big 35 by 19 ft room. This room is equipped with play equipment, dramatic playhouse, Lego tables, and block tables puppet theater, tables and much more. The kids are supervised always in this room. Eating Room, Arts & Crafts, and Classroom- This room is used for eating times, classroom activities, and arts, and crafts. It is located off the spacious room and is equipped with a hand washing sink. There is a window in this room for easy exit in case of emergency. Children are supervised always in this room. Reading Room, Circle Time Room, Learning Center, Nap room- This room is in the east side of the daycare it has an egress window in case of an emergency for easy exit. We use this room as a reading room, and for circle time, and to do our learning center, show and tell etc… The kids also nap in this room. The kids under 2 ½ are always visually supervised in this room unless they are over 2 ½ and older, and want to go to a quiet spot to read, then we follow the guidelines listed above using our own discretion for each child. Restroom- The restroom is located off the kitchen area and by the Reading/nap room. Children are supervised when going to the restroom unless they are age 3 and older. If the parent expresses they need help using the restroom, we will assist them over age 3 yrs. We will always be sure all children use healthy habits when using the bathroom, and washes their hands when they are done. Kitchen area- The kitchen area is located off to the side of the spacious room. It is secured by a child safe gate, and is closed always when the kitchen is in use. There are safety knobs on the gas stove to ensure there are no accidents. I have a pass-through window that goes into the eating room so the kids do not have hot plates being carried over or around the entryway where they are sitting. Children are not allowed in the kitchen for their own safety. If they must use the restroom they must walk through the kitchen, but they are kept safe, and we know they won’t be hanging out in the kitchen area. This room is a small room where the kid’s cubbies are kept, kids are never allowed to play in this area. 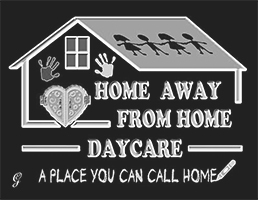 *Home Away From Home no longer cares for children under 18 months of age, but KDHE requires that we still implement a safe sleep policy into play so you understand we have the knowledge base we are required to have to have a Kansas License to own/operate a daycare, and our staff is also knowledgeable on safe sleep procedures & policies listed below. Napping- The children fall asleep to soothing music, and comfortable touches to help them relax. They all have their own designated cots that are kept in a closet, and blankets are washed weekly. Children 12 months or older may sleep on a nap cot with a clean sheet, blanket, pillow if desired. If you feel your child is not ready for a nap cot at 12 months of age they are welcome to stay in a playpen it’s up to you as the parent. Every child has their own nap cot, and their bedding is washed weekly. When the children are napping a provider is in room to assist children with falling asleep. Children napping are in visual or hearing distance of a provider, and checked on every 15 minutes. I do not have any doors that will be closed and all safety gates are remained open. When a child awakens from nap a provider will attend to the child’s needs, and assist the child in moving to another activity. If a child awakes during nap time they can choose a quiet activity until nap time is over. Children under 12 months of age nap or sleep in a pack n play, with a fitted sheet only. There are no blankets, pillows, or toys allowed inside a pack n play while a child is napping or sleeping. Each child will be placed on their back to sleep. When the child is able to turn over independently they will be allowed to remain in the position preferred by the child. Children under 12 months remain in sight or hearing distance from a provider and is checked on every 5 to 10 minutes. Kansas Licensing regulations state you check on infants every 15 minutes, but we check on them very regularly about 5 to 10 minutes apart. My play area is fenced in, and children under the age of 5 years are supervised always while playing outdoors. Children 5 years and older are permitted to play outside unattended but will remain within a provider hearing distance, and the provider will visually check on the child, and respond as necessary to meet the needs of the child.